At the end of 1940, the Non-Permanent Active Militia (NPAM) was redesignated the Canadian Army (Reserve). OF 15th (Vancouver) Coast Brigade, R.C.A., N.P.A.M. Authority to organize the 15th (Vancouver) Coast Brigade, R.C.A., N.P.A.M. was given on 12 Jul. 40 (Exhibit 1). The unit was to be formed as a 2nd Brigade of the 15th (Vancouver) Coast Brigade, R.C.A., and to have the same establishment. This called for 18 Officers and 328 O.R.’s together with a chaplain and M.O. attached. Authorization was given for the calling out of a C.O. or 2nd i/c with Adjutant, Q.M. , 3 Instructors and 2 Clerks. Pursuant to the above, the following Officers were appointed on 16,18 and 19 Jul. 40 respectively: Lt./Col. C.G. Beeston to be O.C., Capt. C.R. Burton, M.C. to be Adjutant, Capt. E.J.L. Morgan to be Quartermaster. Enlistment commenced for the other ranks on 30 Jul. 40 and over 600 applications were received on the first two evenings. Officers taken on strength on reserve status during July 1940 were as follows: Postings of these Officers to the Batteries is shown together with the dates on which they were taken on strength. (Exhibit 2, Part I Order, No. 1. The Majority of the other ranks of the Brigade were enlisted during the first ten days of August, only 164 having been taken on in July. Elementary training got well under way during the month, and it was announced that the Unit would go to camp in Nanaimo during Sept., with the 58th Bty. Going during the first 2 weeks of the month and the 31st Bty. And the 85th Bty. Exchanging with them for the second half. The strength at the end of the month was: 20 Officers and 324 other ranks. 58th Battery, 15th (Vancouver) Coast Brigade, RCA (NPAM) at Nanaimo Camp. The advance party having left for Nanaimo under Capt. Morgan on 31 Aug. 40, the 58th Bty. followed on 1 Sept. 40. The Battery had a strength of 60 Officers and 118 other ranks. The Nanaimo camp was completely new at that time. It was occupied with contingents from all the newly formed reserve units in Vancouver and Victoria. The writer, having attended camp with the 85th Bty., is not in a position to state in detail what happened at the 58th Bty. Camp. The other Batteries were subsequently informed that the 58th Bty struck a very high standard, but whether such standard was in fact as high as that of the other Batteries is somewhat doubted. On 15 Sept. 40 the 58th Bty. left camp and the other Batteries moved in. The S.S. Princess Elaine, carrying the new Batteries, arrived at Nanaimo just as the S.S. Princess Victoria was preparing to depart. Both boats were carrying all the Vancouver personnel from other reserve units as well as the 15th Coast Regiment. The 31st Battery entered camp with a strength of 6 Officers and 101 other ranks, and the 85th Bty. With 4 Officers and 74 other ranks. Throughout the stay of these two Batteries in Nanaimo there was a spell of magnificent weather and training was most vigorously carried on. The N.C.O.’s of the two Batteries were put into an N.C.O.’s squad and trained separately from the rest of the troops. Junior officers were given instruction by Capt. Ransom and were to be seen daily doing most energetic work on one corner of the training ground. They carried the title of “Ransom’s Rangers” and judging by the mileage they covered, the name was fully deserved. With men from several units constituting a large camp, it was possible to arrange a good training programme as demonstrations could be put on for fairly large numbers of men at one time. Instruction was carried out by members of the instructional cadre. Firing practice with rifles on the open range was carried out during the camp with cash prizes being awarded for the best scors by novices and also experienced shots. At the end of the camp, each battery conducted a sub-section drill competition. At the end of the camp, all the units present were inspected by the Inspector-General of Western Canada who expressed himself as extremely pleased with the parading of the troops and also with the condition of Unit lines. An “Army Appreciation” night was held in the Nanaimo Arena on 27 Sep. 40 which was attended by practically all the troops in camp. This produced a most enjoyable evening with a mixed programme. 2/Lieut. R.A. Diespacker of this Regiment was the Master of Ceremonies and his appointment to the Active Force, notification of which had just been received, was announced during the evening. The various events included the final of the inter-Unit volley ball competition in which the Regimental team was just beaten by the Seaforths. Undoubtedly, the most popular event of all was the display of Sgt. Hay’s “Chinese Lancers” with their most unusual methods of carrying out arms drill. Most members of the unit had seen our very accomplished squad practising, but the show was new to the rest of the spectators who very much enjoyed it. On the final afternoon of the camp, the officers were entertained to tea in the Sergeant’s Mess. On 1 Sep. 40, it was announced that the Commanding Officer, Lieut-Col. C.G. 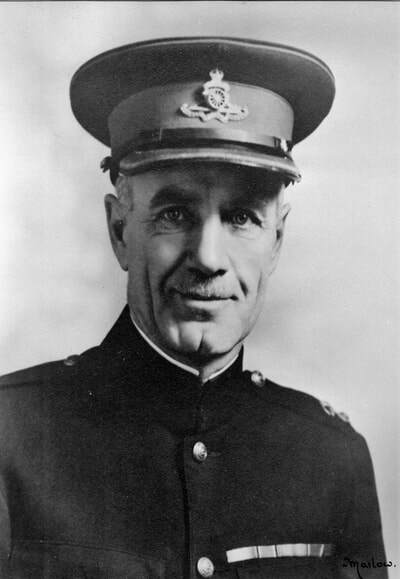 Beeston, had been appointed Officer Commanding Vancouver Defences, and he was succeeded as O/C by Lieut.-Col. F.C. Underhill whose appointment dated 2 Sep., 40. (Exhibit 6, Part One Orders – Numbers 7 to 32. 1 Oct. 40 – Capt. H Morton, M.C. – Appointed to 31st Battery. 4 Oct. 40 – 2/Lt. H.D. Arnold – Appointed to 58th Battery. 4 Oct. 40 – 2/Lt H.S. Andrews – Appointed to 85th Battery. 10 Oct. 40 – Capt. F.C. Whitehead, M.C. – Posted to 58th Battery. Capt. T.F.W. De Pencier – Went as Chaplain to the same unit. On its return from camp, the Regiment commenced Headquarters training with one parade for each Battery per week, and weekend training in the Forts was also arranged. A regimental course for Officers and Senior N.C.O.’s was also commenced and conducted on four evenings per week and in one or other of the Forts on Sunday mornings. Battery parade nights were Tuesday for the 31st Battery, Wednesday for the 58th, and Friday for the 85th. (Exhibit 8 – Part One Orders – Numbers 33 to 37. H/Capt. F.A. Ramsey was attached to the numbers as Chaplain on 11 Nov. 40. Other attachments of interest were those of 2/Lieut. K.T. Thurston and Cadet H.F. Jones of the C.O.T.C who were attached in order to take a Regimental Course, and that of Sgt.-Instructor H.N. Osgood of the Instructional Cadre who was attached on 30 Nov. 40. Parades and duties were carried out without any matter deserving comment coming up. (Exhibit 10 – Part One Orders – Numbers 38-44. Exhibit 11 – Part Two Orders – Numbers 25 to 29). Lieut. R. Wilson of 31st Battery was transferred to the Corps Reserve of Officers effective 1 Nov. 40. On 14 and 15 Dec. all the Junior officers wrote their examinations, all of them writing the “Special to Coast Defence” paper and four writing the “Common to All Arms” paper. It speaks well of the diligence of the Officers concerned, and particularly of the ability of the instruction received from personnel of the 15th Vancouver Coast Brigade, R.C.A., C.A.S.F. , that every candidate qualified. On 17 Dec. 40, a dance was held at the Commodore under the auspices of this Regiment and the Canadian Women’s Training Corps. The majority of the Brigade attended and the party was a great success. (Exhibit 12 – Part One Orders – Numbers 45 to 47.